As was discussed here, let's propose T9A to have both a fantasy Human Korea (quite much a given, to be expected) with a few Dwarven Holds in its numerous mountains (not a given). Let's pick Aseadal as a working name for this land, for the moment being; by taking Asadal (the name for the mythical first Korean city, founded by Dangun, a God-King descended to Earth) and inserting "ea" from the end of Korea for a mash-up. In the concept drawing above, the Dwarves of Aseadal Peaks take aesthetic cues from both Korean bronze age culture (especially the Liaoning type dagger), and the ironworking Gaya confederacy (42-562 A.D.) of the Three Kingdoms era, with its famous plate armour suits. The hexagonal shield shape is borrowed from Baekje, contemporary of the Gaya in the peninsula. 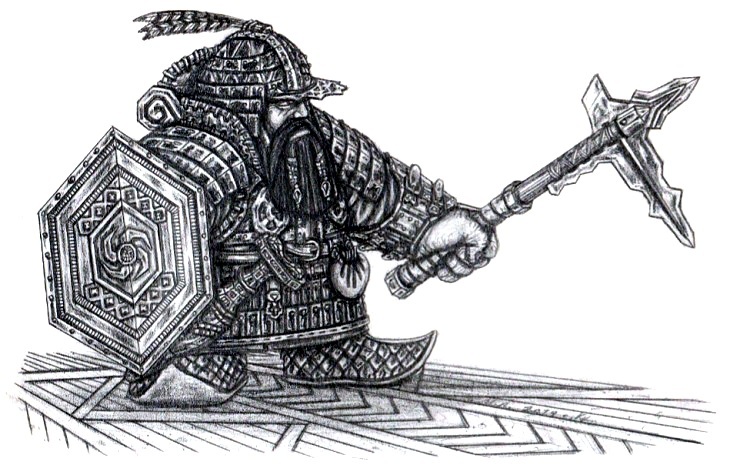 To distinguish the more heavily armoured Dwarrows of T9A's fantasy Korea from the proposed Sky Foothill Dwarves, all Dwarven Holds within Aseadal ought to be independent of the Human kingdom surrounding them, as is the norm for isolated Dwarven Holds elsewhere in the world. 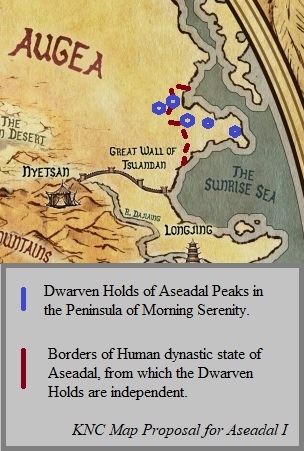 Having Dwarven Holds within the borders of Grand Tsuandan be subject to the Human Emperor is one way to play up the sheer exceptional power of Tsuandan (able to cow even Dwarves bunkered up in their heavily fortified highland Holds, and thus field some Dwarven auxiliaries in her armies), while the Aseadal Dwarves face a normal separated situation visavi the Humans around them.